More and more studies are finding a host of health benefits for those who drink green tea. And it’s not a new concept; for centuries, the Chinese have viewed green tea as a health elixir, ever since it was first discovered there about 4700 years ago. If we are to believe the legend, it was Chinese Emperor Shen Nong (who also happened to be an herbalist) who first discovered the tea. He was sitting outside by a fire when some leaves from the burning twigs that had been used for fuel rose up on a column of warm air and subsequently landed in the pot of water he was boiling. 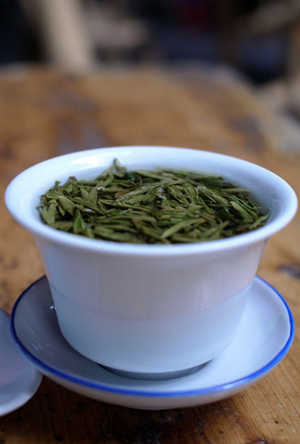 His inquisitive nature spurred Shen Nong to conduct extensive research on the brew and concluded that green tea was an effective antidote to over 70 different poisonous herbs. Not only that, he also believed it could be instrumental in treating a number of other afflictions such as tumors, abscesses, bladder problems and lethargy. A recent study published in the American Journal of Clinical Nutrition that was conducted by researchers at the Tohoku University Graduate School of Medicine in Japan found that those who drink the most green tea maintain the best function in old age. Over 14,000 Japanese aged 65 or older were studied over a period of three years. Only 7 percent of those who drank 5 cups of green tea a day or more had problems with basic functioning such as the ability to dress and bathe themselves, as opposed to 13 percent of those who drank a cup or less per day. China and Japan can boast the highest life expectancy as well (at 82.2 and 82.6 years, respectively), which may or may not have to do with the fact that they are also the countries with the highest per capita consumption of green tea, but it certainly doesn’t hurt! The plant Camellia sinensis is the source of both green and black tea. Although the plant is the same, the way the two teas are processed is quite different. Green tea is subject to only minimal processing, whereas black tea is created by fermenting the leaves. Because of the minimal amount of processing, more of green tea’s healthy polyphenol antioxidants are preserved. Catechins (the type of antioxidants that are particular to tea) are believed to be the primary reason for the health benefits of green tea. Catechins can be thought of as a sort of super-antioxidant; according to Harvard Women’s Health Watch article, catechins are superior to both vitamin E and vitamin C in halting the oxidative damage that is caused to cells by free radicals, and numerous studies have discovered an association between reduced rates of heart disease and cancer and the consumption of green tea. Green tea has been shown to be particularly useful in guarding against cancers of the breast, bladder, ovary, colon, lung, pancreas, prostate, skin and esophagus. Furthermore, green tea has the ability to raise “good” HDL cholesterol, lower “bad” LDL cholesterol, and improve arterial function. A 2006 study published in the European Journal of Clinical Nutrition found that drinking green tea was even better for you than drinking water; not only does the tea provide hydration at a level similar to that of water, it also brings with it healthy polyphenols. Another study published in the Journal of the American Medical Association in 2006 discovered that drinking green tea was associated with a reduction in the total risk of death, a benefit that black tea cannot match. Those who drink green tea have a lower risk of stroke, periodontal disease, osteoporosis, and a lower incidence of viral and bacterial infections. It can reduce your risk of type 2 diabetes by helping to control your blood sugar level, and studies have shown it reduces the inflammation that is a result of Inflammatory Bowel Disease. It also aids in fat burning by helping to boost the metabolism. An average consumption of three cups per day of green tea is thought to provide the optimal amount of polyphenols, which is about 240-320 mg. If you are interested in trying this healthful brew for yourself, use one teaspoon of green tea per each 5 oz. cup and pour hot (but not boiling) water over the leaves, letting it steep for approximately two or three minutes. If the water is too hot it will give the tea an astringent and bitter taste. More restaurants are adding green tea to their menu these days, so ask for it when you’re out. It’s far healthier than standard iced tea and tastes great too!